The Qualstar Q80 scalable tape library is designed to be Simply Reliable, providing superior performance, reliability and scalability for short-term backup/disaster recovery and long-term archiving requirements. The Q80 system offers capacity scaling from eighty to five hundred and sixty cartridge slots, and throughput scaling from one to forty-two tape drives. With each 6U high Q80 library module delivering up to 960 Terabytes (LTO-8, native) of storage capacity or up to 2.4 Petabytes (LTO-8, compressed). 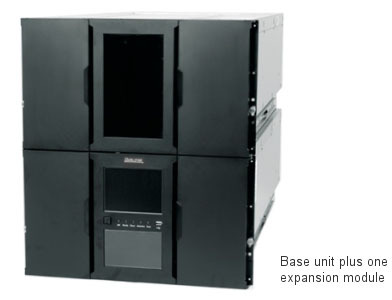 The Q80 base unit may be expanded with up to six additional expansion modules supporting creation of a single library system with as much as 16.8 Petabytes (compressed) storage capacity in a single 42U rack.